At the end of this first cycle (I-IX), it is time to rest and reflect on all that has been learned. It is time to ruminate on the wisdom of Starseed’s passage thus far. To achieve the silence to contemplate such important lessons, Starseed is guided to go into a sort of hermitage, far from the distraction of people and events, and back to the quiet of nature, where the greatest truths lie. 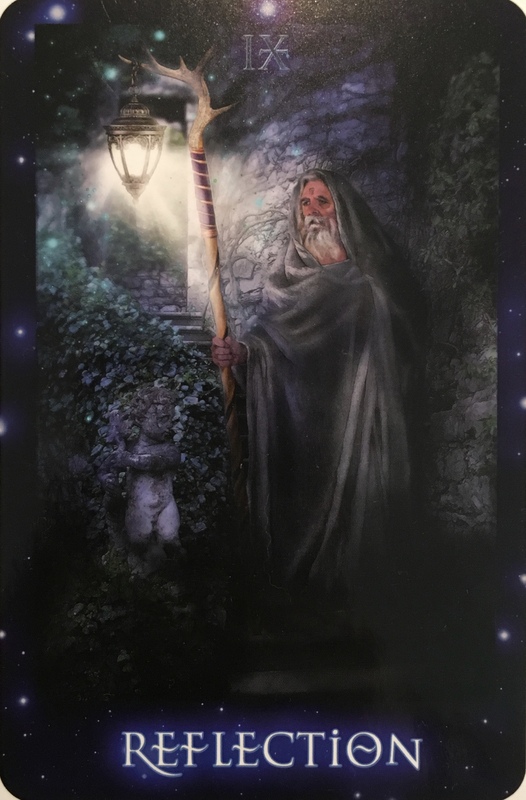 At a time when human kind is bombarded with all manner of noise and distraction via our personal interactions, technology, and media, the path of the hermit can be the remedy to restoring peace in the mind and soul. Associated with Reflection are the words hermitage, silence, contemplation, meditation, stillness, and peace. The transformation you are going through may create some friction in your life. You may find that you are no longer in alignment with certain relationships, occupations or lifestyle choices. Things that once appealed to you no longer hold your attention, and truths that you may have chosen to ignore are now too glaringly obvious. This can cause fear and discomfort. It can cause people who are close to you to object. It may cause judgment and it may even cause rejection. Try not to take it to heart, it is all part of the process. It is time to reflect back on whether there were times in the recent past that you saw evidence that you had outgrown a particular situation and yet felt unable to deal with it. Maybe you were afraid to hurt someone; or you were afraid your financial situation wasn’t strong enough for changes to be made. Maybe you felt obligated to someone or something. Or maybe you just chose to ignore it out of fear of the new, the unknown. But now you do know it, and this knowing comes from deep within. There is no hiding from this knowledge. There is only opportunity for change. Use the reflection to see the truth. Use it to make positive changes; necessary changes. Use it to change your external world to match your internal world.